How to define GDEF in Glyphsapp? GDEF is controlled by the glyph name and glyph info as set forth in the glyph data. You can override in a specific .glyphs file by choosing Edit > Info for Selection in font view. I am failing to understand what defines this above table. Is it Category or Sub-Category? all glyphs with “Mark” Category is not in the above table. what defines the Glyphs as a “BASE”? 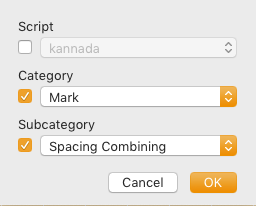 Category “Letter” or Sub-Category “Letter”? Combining marks go in there. Perhaps it also needs to appear in mark/mkmk, i.e. needs to contain anchors. The ones you have in the GDEF Mark definition probably do, right? marks need to be category = Mark and subCategory = Nonspacing or Spacing Combining. Base are all glyphs that are not Marks and Ligatures and have anchors. I am not seeing a pattern, how some are selected and some are ignored! Should I rename all the glyphs to Glyphsapp convention? Did you verify their glyph info (Cmd-Opt-I)? Can you send me the font?